New wet wall/pond feature in the greenhouse. The greenhouse sits atop Carnegie Science Building and runs the entire length. The facility is used for course-related labs, and student and faculty research in biology, environmental studies, and chemistry. A collection of succulent, temperate, tropical, and neo-tropical plants are maintained by student workers and the greenhouse coordinator, Mary Hughes (x6942). The roof has automated ventilation (high cfm blower assisted) and manual table level vents. Supplemental heat is provided via hot water baseboard. 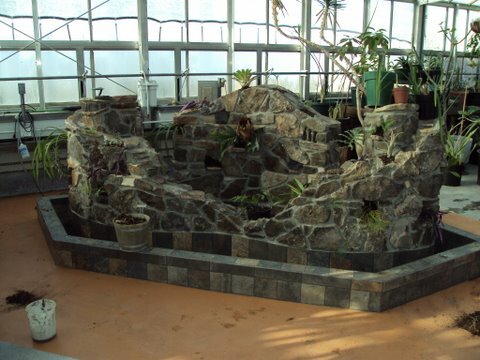 A recirculating wet wall and pond feature are used to cultivate various vascular and non-vascular plants. The greenhouse coordinator maintains all needed supplies for routine cultivation.